To improve productivity, set up pantries near or in the restroom, which can be used to safely store consumables. This greatly reduces the amount of paper that workers have to keep on their carts, and minimizes time spent traveling back and forth to restock. A lot of newer buildings are being built with a small closet between restroom sets for this specific purpose. Managers of older facilities that have limited storage space should consider strategically placing cabinets around the facility, specifically to store paper for restroom service. If the cleaning operation is using the paper supply as cleaning cloths for wiping down surfaces in the restroom, stop. It’s costly and doesn’t provide an optimum cleaning result. It also guarantees more trips to storage for paper because it’s being used much more than intended. Instead, consider switching to huck towels or heavy-duty microfiber cloths. Both are launderable and more absorbent than paper. Managers should also consider reducing the amount of chemicals used for cleaning restrooms on a daily basis. A good germicidal detergent that can be sprayed on surfaces, as well as used for mopping, is really the best chemical for addressing restrooms daily. It simplifies the restroom cart set-up and makes it so custodial workers are only responsible for managing one type of chemical on their cart. This can help reduce confusion and ensure that custodians can move through the facility more efficiently. To streamline restroom cleaning times even further, managers should consider replacing Kentucky mops, large buckets and wooden mop handles with telescoping microfiber flat mops and dual-sided buckets when mopping restrooms. This provides better cleaning with reduced water and effort. Most Kentucky mops can hold up to one gallon of water, which translates to eight pounds of weight at the end of the mop handle. The results is more time and effort custodial workers spend on cleaning. Flat mops, on the other hand, hold much less and glide through restrooms much more efficiently. The dual-sided buckets also keep the dirty, polluted solution separate from the clean solution, which means less frequent solution changes. When considering a mop bucket, smaller is normally better for restrooms. Mop buckets do tip over — often — especially when they’re filled with eight gallons of solution and go rolling over thresholds on a restroom cart. Managers can reduce wasted cleanup time by simply opting for a smaller bucket. Finally, when scheduling restroom floor deep cleans, consider spray-and-vac or spray-and-squeegee technology. This is especially the case for large buildings with a number of restrooms. Incorporating equipment like this is a very simple way to maintain a high level of appearance and improve cleaning times. Keeping these guidelines in mind when addressing staff workload can help managers achieve optimal results in the restroom. The best cleaning operations tend to establish high levels of restroom cleanliness when using this very approach. Managers are encouraged to do a small test of this in one building, with one team. Review the results and adjust cleaning times as they improve. 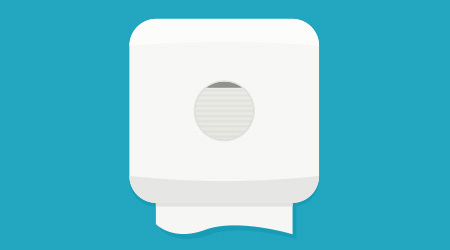 You’ll be surprised at how much easier it is to workload restrooms. BEN WALKER is the Director of Business Relations at ManageMen, Inc. He performs progress and baseline audits for facility operations across the country and works in conjunction with ISSA to develop the “Cleaning Times” booklets.